When Britain's Prince William presented his fiancee, Kate Middleton, with a blue sapphire ring surrounded with diamonds last November, he didn't realize Kate wouldn't be alone in saying “I do.” In fact, though uncounted throngs of women “do want” the $45,000 ring which had formerly belonged to the late Princess Diana, they're settling for replicas priced as low as 3 yuan (about 45 cents). 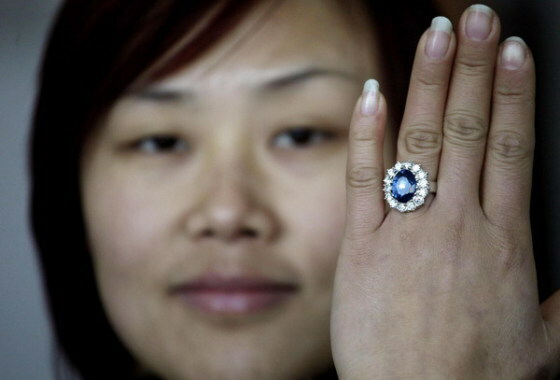 Of course, for under a buck you'll get something that superficially resembles the royal engagement ring – from a distance – and is made from acrylic plastic and metallic alloys. Better quality rings featuring zircon stones set in silver-plated copper sell for around 50 yuan ($7.56). As one might expect, a cornucopia of Royal Wedding memorabilia has or is about to hit store shelves in the leadup to the April 29th, 2011 wedding – and beyond. Says Fu Xuxian, owner of the Yiwu Unnar Jewelery factory, “I feel that memorabilia associated with the royal family should be able to sell well in the long term.” To that end, Fu's factory is churning out wedding memorabilia replicas like mugs, cups, plates, mini teddy bears and key chains prominently featuring the soon-to-be wed royal couple. It's replica rings that have really seized the public's imagination, however. 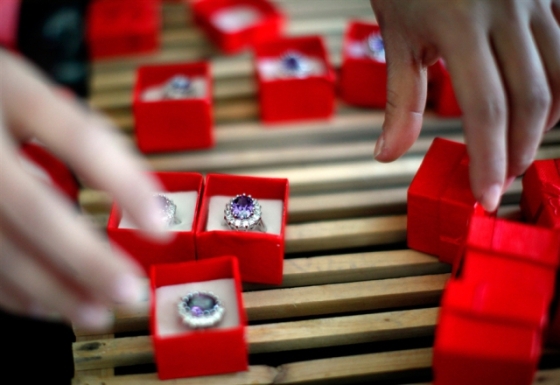 According to Zhou Mingyang, replica rings were being ordered by customers in the United States, the United Kingdom, and Western European countries – and, of course, China. China To Create Database of Blacklisted Journalists, But Could It Backfire? That's unexpected, I wouldn't think such cheap royal engagement rings replica would have such a success. I doubt people buy them in order to propose though, because that is the time when you should be a real diamond buyer, you don't want to get your future wife a ring replica since every girl wants their own unique engagement ring, I can tell you this for sure. I love to read your article. I will buy engagement ring for my wife. Thanks for the information. Pretty crazy article about rings, thanks for the story. Their engagement ring is too fancy for me. I like wearing rings with simple designs. I like her engagement ring. I really like the blue sapphire stone. Blue sapphire exists in various mixtures of its primary (blue) ... of the largest faceted gem-quality blue sapphires in existence. I'd rather have a simple gold ring with little real stones or with even one tiny stone than a really fancy one but fake. Enhance your love with nice looking engagement rings Winnipeg to cheer up with your loved ones on your engagement, and make that special day as tremendous movement in your lifetime. Simply buy your best quality and best model of engagement rings on online, and enjoy yourself a lot with excellent satisfaction.